This blog post is all about: psychoanalysis :), that we all behave (occasionally) like parents & children, if you adopt parent ego state - you're forcing your interlocutor to adopt child stance, sometimes to resolve discussion that seems irreversibly stuck - the easiest way is to map the interaction to psychoanalytic model/pattern. I love working with smart people - apart from all the other reasons, I keep learning new stuff from them on daily basis. That's how I've come up with the topic of this blog post (thanks Agnieszka!) - this stuff is so good, I couldn't resist sharing it with you ... 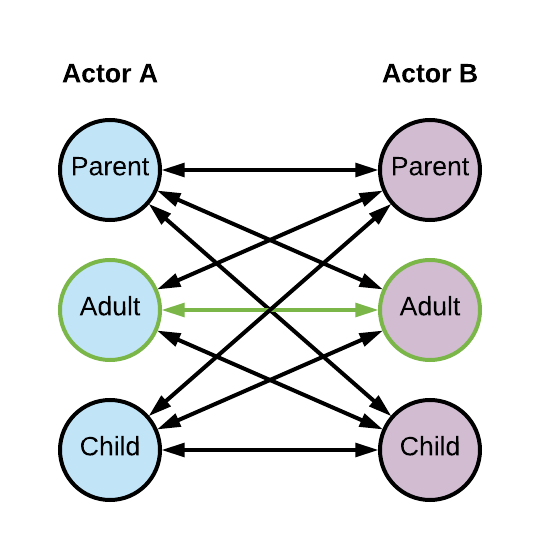 So let me introduce you to: Transactional Analysis. "Adult" stance is simple & straightforward - person who adopts this attitude is open-minded, listens actively, discusses rationally, strives towards set-up goals/outcomes & doesn't subdue to her/his emotions. Not a rocket science so far, right? And so it goes - deep, energetic emotions favour "child" stances while over-rationalising peppered with strong belief in one's reason draw us towards "parent" stances. Needless to say all combinations of stances happen "in the wild" - some are more common, while some are "reserved" for more specific cases. This theory is freaking brilliant! Seriously, I'm not going to dive deeper into post-freudian considerations of how our own relationships with parents (yikes!) may determine stances we (subconsciously) lean towards in adult life, but I truly have a feeling that trying to map actual interaction (conversation) on one of the Transactional Analysis combinations can really be very helpful with understanding the real issues (especially when we clearly see that discussion is not progressing) & achieving much more fruitful outcomes. When does a "start-up" lose its label?